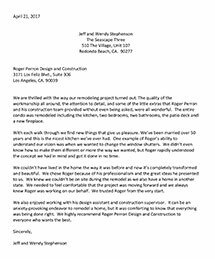 Stephenson » Roger Perron Inc.
We are thrilled with the way our remodeling project turned out. The quality of the workmanship all around, the attention to detail, and some of the little extras that Roger Perron and his construction team provided without even being asked, were all wonderful. The entire condo was remodeled including the kitchen, two bedrooms, two bathrooms, the patio deck and a new fireplace. With each walk through we find new things that give us pleasure. We’ve been married over 50 years and this is the nicest kitchen we’ve ever had. One example of Roger’s ability to understand our vision was when we wanted to change the window shutters. We didn’t even know how to make them different or more the way we wanted, but Roger rapidly understood the concept we had in mind and got it done in no time. We couldn’t have lived in the home the way it was before and now it’s completely transformed and beautiful. We chose Roger because of his professionalism and the great ideas he presented to us. We knew we couldn’t be on site during the remodel as we also have a home in another state. We needed to feel comfortable that the project was moving forward and we always knew Roger was working on our behalf. We trusted Roger from the very start. We also enjoyed working with his design assistant and construction supervisor. It can be an anxiety-provoking endeavor to remodel a home, but it was comforting to know that everything was being done right. We highly recommend Roger Perron Design and Construction to everyone who wants the best.